Honda has announced prices for the new Honda Jazz supermini and the stunning new Honda HR-V subcompact crossover. The new Jazz will be priced from €17,395 for the entry-level SE model, rising to €21,900 for the flagship EX CVT model, while the new HR-V will be priced from €23,995 for the 1.5 i-VTEC petrol, and from €25,995 for the frugal 1.6 i-DTEC diesel. The Jazz builds on the strong reputation of its highly successful predecessors. The newcomer retains the classic Jazz silhouette, yet exhibits distinctive contemporary styling, including a powerful new face and strong character lines. A new platform increases overall length by 95mm, but highly efficient packaging means the latest Jazz is proportionally even bigger on the inside than the previous generation model. Occupants will benefit from both boot space (354 litres with the rear seats up and 1,314 litres with the rear seats down ), and passenger space that are unrivalled in the class. The new Jazz offers exceptional versatility, retaining Honda’s highly practical Magic Seat system which allows for numerous cargo configurations and a maximum interior loading length of an impressive 2,480mm. Specifications are generous across the range, with all models fitted as standard with convenience features, such as air conditioning, cruise control with speed limiter, and dusk sensing auto lights. Every grade also comes with Honda’s city-brake active to help avoid low-speed accidents. Customers opting for the ES or EX models will also benefit from the Honda Connect in-car infotainment system as standard. This Android-based system features an app-based ‘pinch, swipe and tap’ interface accessed on a seven-inch touchscreen in the centre of the dash. Designed and engineered to achieve a five-star Euro NCAP rating, every new Jazz sold in Ireland will be equipped with city-brake active as standard. ES and EX models will be fitted with Honda’s 'Dynamic Safety Pack', which uses radar sensors, plus forward and rear-facing cameras. This comprehensive suite of active safety technologies includes forward collision warning, traffic sign recognition, intelligent speed limiter, lane departure warning and high-beam support system. A new, highly efficient, highly responsive 1.3 litre i-VTEC petrol engine from Honda’s Earth Dreams Technology series delivers 102PS at 6,000rpm. This power unit delivers the sprightly driving performance of the previous Jazz’s 1.4 litre engine, together with fuel economy equivalent to its 1.2 litre. Combined with either a six-speed manual gearbox or a newly developed CVT, emissions are as low as 106g/km of CO2 for annual road tax from €190. The CVT’s driveability is given a more natural ‘multi-gear’ feel through the use of new control software exclusive to Europe which simulates seven speeds and provides optimised gear change mapping. The new HR-V blends characterful coupé looks merged with the tough, solid stance of a robust SUV. Inside, occupants will find class-leading boot space (470 litres with the rear seats up and 1,533 litres with the rear seats down ). Thanks to innovative packaging, the HR-V has exceptional versatility incorporating Honda’s highly practical Magic Seats system, allowing for numerous loading configurations. Buyers opting for the SE model will have features such as alloy wheels, climate control, cruise control, Bluetooth, dusk-sensing automatic headlamps and a city-brake active system fitted as standard. Similar to the new Jazz, new HR-V buyers opting for the ES or EX models will benefit from the Honda Connect in-car infotainment system as standard. Designed and engineered to achieve a five-star Euro NCAP rating, every new HR-V sold in Ireland will (similar to the new Jazz ) be equipped with Honda’s city-brake active system as standard, with ES and EX models will feature Honda’s Dynamic Safety Pack. Honda says the HR-V boasts an engaging drive coupled with efficient performance, thanks to a choice of new 130PS 1.5 litre i-VTEC petrol and 120PS 1.6 litre i-DTEC diesel engines. Combined with either a six-speed manual gearbox or a newly developed CVT (for petrol models only ), emissions are as low as 104g/km of CO2 for annual road tax starting from €190. The CVT’s driveability is given a more natural ‘multi-gear’ feel through the use of new control software exclusive to Europe which simulates seven speeds and provides optimised gear change mapping. 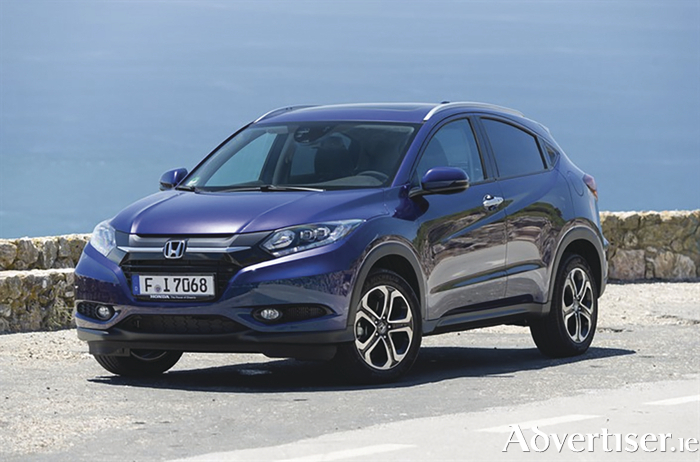 The new Honda HR-V arrives here later this month (October ).